If you’re in the market for something stylish, efficient, and modern, then you may have found yourself wondering how the 2016 Mazda3 compares to the 2016 Hyundai Elantra. Just looking at some of the numbers, they both seem like great buys. They also come with modern perks like MP3 capability, auxilary inputs, speed-sensitive volume, and LCD screen. The two are both going to put up very good fuel efficiency numbers, with the edge going to the 2016 Mazda3 — especially when it comes to highway numbers. The Elantra is boasting a City 8.8L/100km, Hwy 6.4L/100km rating, but it just can’t keep up with the 2016 Mazda3’s City 8.0L/100km, Hwy 5.8L/100km rating. 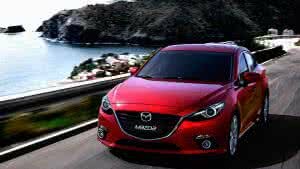 The 2016 Mazda3 does this with a larger, more powerful engine that offers more horsepower and torque, giving it a bit more zip than the Hyundai Elantra. At this point, they both look like good choices. Both the 2016 Mazda3 and 2016 Hyundai Elantra have a lot of modern perks, like a LCD screen. Navigation systems are offered on the Mazda3 where they aren’t on the Elantra. The Mazda3 also comes with a standard backup camera instead where as its optional with Hyundai.